"It’s no surprise that their chocolate cake is a crowd favorite." "One of the easiest boxed cake mixes to make." "This cake mix boasts a distinctive vanilla flavor." "It includes pudding which keeps the cake moist." "Makes just six cupcakes, so it’s great for small families or couples." "The simple mixture allows you to concentrate on decorating your dessert!" "Has the signature deep red color along with the distinctive flavor." "Includes a lemon glaze mix that can be drizzled over the cake." "This mix increases protein content and reduces the glycemic impact." 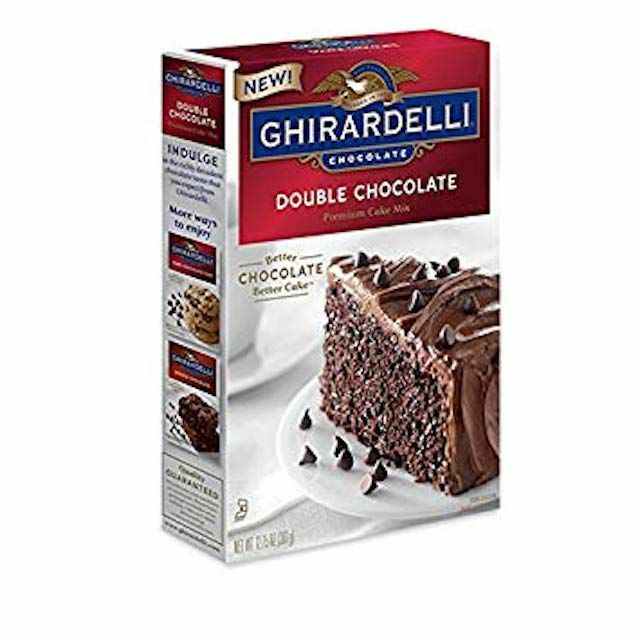 Ghirardelli is well known for its chocolate products, including baking bars, candy, and drinking chocolate, so it’s no surprise that their chocolate cake is a crowd favorite. This easy cake mix requires eggs, water, and oil, and hand mixing is recommended, so you don’t even need a hand mixer or stand mixer to make this cake. Two boxes of cake mix are included, and each one makes one 8-inch or 9-inch round cake or 12 cupcakes. While this is more expensive than many other options, users say this cake doesn’t taste like a mix, so they’re happy to serve it to their family or use it for special occasions. Make sure your cake is baked right with our selection of the best cake pans. Probably best known for cornbread mix, Jiffy is a generations-old company that sells boxed mixes for a wide variety of products. This yellow cake mix is one of their most popular and well-rated products. One of the easiest boxed cake mixes to make, all you need is water and an egg to make your cake in a round or square pan. Customers say that there are plenty of creative ways that you can use this mix, too. Many home bakers recommend combining this yellow cake mix and Jiffy cornbread mix to make a sweet cornbread. This mix can also be used for cobblers or to make a crumb topping, and the box includes a recipe for “chewy bars” if you need even more inspiration. Looking for the perfect cornbread mix to make as a side dish? Check out our list of the best cornbread mixes. Vanilla may not be everyone's favorite flavor, but a rich and flavorful vanilla cake can be delicious—especially when paired with vanilla buttercream frosting. Keep in mind that vanilla cake doesn't have the same flavor as a basic white cake and it doesn't have the "egginess" of yellow cake. This cake mix boasts a distinctive vanilla flavor and includes pudding to make it moist. This mix makes one 13 x 9-inch pan, or two 8-inch or 9-inch round cakes, so you’ll have plenty for a party or event. Plus, all you need is oil, water, and one egg. Before you start baking, stock up on the best baking supplies available online. A favorite chocolate cake mix for both novice and experienced bakers, this Betty Crocker mix includes pudding to keep the cake moist. It requires water, oil, and egg, and the box includes instructions for baking in a 13" x 9" pan, 8-inch or 9-inch rounds, or a Bundt pan (if you don't have a Bundt pan there are other pans that you can use to make a ring shaped cake). You can also use this cake mix for making cupcakes, so you’ve got plenty of options for baked goods. If you want to create something extra special, check out our favorite cake decorating tools. While most cake mixes include instruction for making cupcakes, this mix is designed specifically for cupcakes. Described as a malted milk ball in cupcake form, this includes both the cake mix and the frosting mix, so you don’t need to worry about finding a compatible frosting flavor. The mix makes just six cupcakes, or eight if you use the high altitude instructions, so it’s great for small families or couples who don’t want a huge batch of cupcakes lurking in the kitchen. This mix requires melted butter, egg, and milk, which all add to the richness of the finished product. The frosting requires softened butter and milk. As an added bonus, the Essential Goodness line of baking mixes from King Arthur Flour has a charitable component. For each box purchased, King Arthur Flour donates the cost of one meal to Feeding America. If you're making cake pops but don't have the time to make the cake from scratch, opt for a light-colored cake mix like the Gold Medal White Cake Mix. This is a bulk 5-pound bag so you can make as much or as little as you like, and the basic mix only requires water. The simple mixture allows you to concentrate on the fun part—decorating your dessert! From Easter egg cake pops to pumpkin shaped cake pops that are perfect for Halloween, there are a ton of creative recipes that allow you to customize these petite desserts. You can also add butter, eggs, or oil to enhance the richness and flavor if desired, and the mix can be used as a base for cookies. This bag contains enough to make eight 8-inch round cakes as well as other shapes or cupcakes. Red velvet cake got its start in the southern United States, but its popularity has grown significantly. If you don't want to attempt a red velvet cake from scratch, this delicious cake mix has the signature deep red color that still evokes an “ooooh” when the cake is cut—along with the distinctive flavor. This mix requires water, egg, and oil, and includes instructions for baking in a 13" x 9" pan, two 8-inch or 9-inch round pans, a Bundt pan, or for making cupcakes, so you’ll have plenty of options when it comes time to bake. This is a single box of cake mix. Pound cake is distinctly different from standard cakes. It has a denser texture with a fine crumb and is a moist cake that’s just as good for breakfast as it is for dessert. It pairs well with berries or ice cream and it can be used as the base of a strawberry shortcake when you’re in the mood for a fancier dessert. This pound cake is flavored with Meyer lemons, which aren’t as tart as standard lemons, and the mix includes a lemon glaze mix that can be drizzled over the cake. You'll need water and melted butter for the cake mix, while the glaze simply requires water. This is meant to be baked in an 8" x 4" loaf pan. If you need more inspiration, the box includes a recipe for making jam tea cakes using a pound cake baked according to the instructions, so your pound cake will be ready for a party. This includes two boxes of cake mix. Looking to make more sweet treats? Read through our best waffle mix article. Gluten-free baking can be difficult, but box mixes can make it much easier. This mix includes almond flour and coconut flour that not only make it gluten-free but also increases the protein content and reduces the glycemic impact. It also checks other dietary boxes, since it’s grain free and it doesn’t include corn, dairy, or artificial ingredients. It's also paleo friendly, vegan, and non-GMO. This requires eggs, oil, and water. If you want a vegan cake, there are several options for replacing the egg. This makes an 8-inch round cake and can also be used for cupcakes.